This work problematizes the distribution of cultural monies throughout the world, especially the ‘Western’ colonisation of so-called developing or troubled countries. Here the paradigm of the Dutch colonial empire is used as a system in order to question the use of public money. What is still ‘Dutch’ in the 21st century and what are the effects of these colonial histories? By taking a certain amount of capital, in this case 20.000 Euros, this public money allotted for culture is then invested in Dutch companies in their former colonies. Instead of reaping the profits of the investments and bringing the income back home, the generated interest remains in the country and is given back to those living in these former colonies. 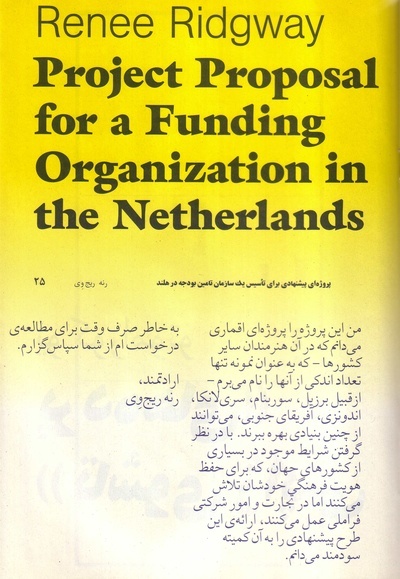 If willing and interested, cultural producers (artists, curators, writers, musicians, dramaturgs) from these countries can work in the Netherlands for an amount of time, gaining experience and using the funds (interest) generated from the original Dutch public money and its profit to support their endeavors. The Dutch would also benefit from such an exchange. Pages project is defined through activities, such as the publication of a bilingual Farsi/English magazine, architectural proposals, video documentations and installation works. Pages was started in 2004 by artists Nasrin Tabatabai and Babak Afrassiabi as an ongoing project, examining the possibilities of interaction and reflection between various local discourses and condition that may generate spaces of critique or instances of critical practices. Ridgway is an artist, curator, writer and educator based in Amsterdam. See biography tag for more information.